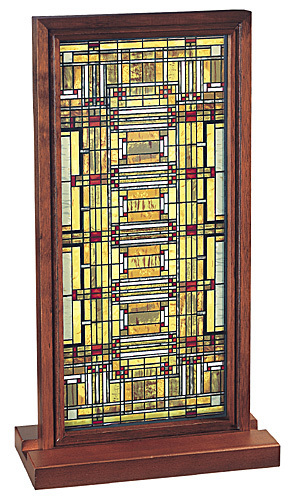 Adapted from an art glass skylight designed by Frank Lloyd Wright, circa 1904, for the reception room of his Oak Park architectural studio. With an abstract pattern inspired by nature, the skylight is made of myriad green and gold rectangles and clear glass. Frank Lloyd Wright lived and worked in Oak Park, Illinois, from 1889 to 1909. It was here that he created a new form of American architecture known as the Prairie style. The Frank Lloyd Wright Home and Studio is a museum property of the National Trust for Historic Preservation. Wright's Oak Park home and studio.